A second diabetes mellitus symposium presented by Ibn Al Haytham Pharmaceutical Industries under the title " DPP4 – Inhibitors , Five Years of an International Experience " was held at Yaafour resort in Damascus . It came in the range of the scientific activities series sponsored by the company in Syria . - " Management of T2DM " by Dr. Nabil Isseh . - " Adding an Incretin-Based Therapy Early in T2DM Treatment Evaluating Options Using Guidelines " by Dr. Najat Sniej . - " DPP4 , Treatment with Sitagliptin " by Dr. Abdallah Dlewaty . - " Sitacretin Plus " by Dr. Noman Dormosh . After that , there was a discussion table in cooperation with Dr. Najat Sniej , Dr. Abdallah Dlewaty and Dr. Sameer Ewies to answer the attendance questions . 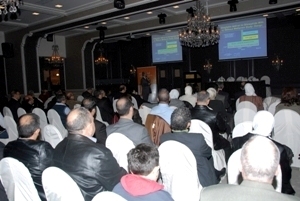 Many endocrinologists and internists from Damascus attended the symposium in which answers were given for inquiries about the usage of DPP4 inhibitors . The doctors also highlighted its importance in the treatment of diabetes mellitus , more than that its additional merits such as preventing hypoglycemia , alleviating patient’s weight in addition to new studies explaining its efficacy concerning cardiovascular system .